At the very beginning of Freemake review, let's have a brief talk about video converter. It's a known fact that video exists in many formats. Some are extremely common whereas some are only used on special devices or players. That’s why video converter software springs up in the market, transferring video from one format to another. Generally, we prefer to spend on things that are good value for money, and video converter is no exception. The best video converter can not only repackage video files in one format to make them viewable in other formats that would look great playing on your portable device, whenever and wherever, but also offer customers affordable price. And Freemake Video Converter combines almost everything you need into a simple and one-stop-shop for all your video converting and editing needs, all making it happen in a couple clicks, not mention it’s free of charge. This is also the reason I give the review of Freemake Video Converter today. You maybe have a fuzzy concept about this Freemake Video Converter and wonder how Freemake works. To help you make a better understand of it, the background information will be further discussed in reviewing Freemake software. Freemake Video Converter is video conversion and editing software to convert between popular video formats, create image slideshows, music visualizations, and more developed by Ellora Assets Corporation. Its simple-to-use interface and powerful video converting ability lay a solid foundation for its present achievements among customers. Even though Freemake Video Converter enjoys such a great reputation, it still has drawbacks in many aspects. So in Freemake review, let's have a look of its both merits and drawbacks further. Ultimate Freemake alternative for Mac users to convert videos to MP4, MOV, M4V, MP3, etc for playback on iPhone XS/XR/6S/6S Plus/6/6 Plus/5S, iPad mini 4/Air 2/Pro, Android Samsung Sony HTC 83X faster speed & no quality loss. As is mentioned above, whether you want to convert AVI to MP4 or convert MKV to H.264, or show your family and friends about all your special moments, whenever and wherever, Freemake Video Converter translates most of that for you. In addition to straightforward format conversion, Freemake Video Converter also offers additional features like trimming video content, extracting audio tracks without quality loss, and uploading your content directly to your YouTube or Facebook account. Still, for a free application with a no-brainer interface, Freemake Video Converter is where it's at. In the meantime, we shall keep in mind everything has two sides. That means when we enjoy its advantages, we shall also be clear about Freemake shortcomings. Although Freemake Video Converter boasts supporting a wide range of video formats, when it comes to some popular formats such as DIVX or XVID Freemake cannot live up to its hype at all. Still, Freemake Video Converter provides very little low-level control over the videos it creates, which might frustrate experienced users. What's more, the aforementioned installation issues still bother you to no end. Worse still, if you are a Mac user, Freemake Video Converter will disappoint you for it is only designed for Windows7/Vista/XP, leaving you busy finding a Freemake for Mac alternative. 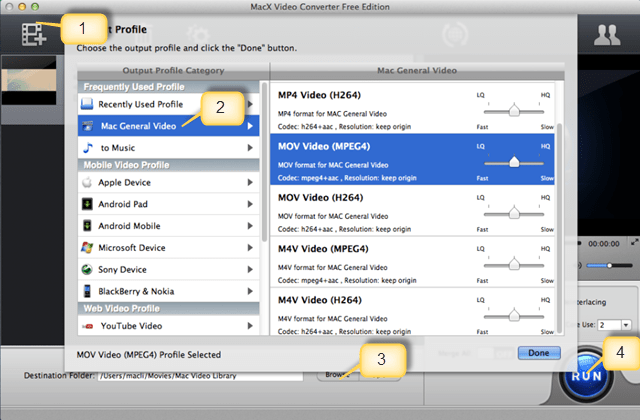 If you still rack your wits about finding a Freemake alternative to convert video on your Mac, MacX Video Converter Free Edition is absolutely your cup of tea. This alternative to Freemake video converter for Mac works excellently to free onvert among a wide range of formats like MP4, MOV, FLV, AVI, etc and comes with a variety of ready-to-use profiles for iPhone, iPad, iPod, Android, Blackberry and other devices. Besides, video editing, parameter adjustment, Hyper-threading technology and wizard-style interface have oiled the process of video conversion as fast and easy as possible. You can just download Freemake video converter for Mac, add video file you’d like to convert to the Freemake Alternative, choose the output video format or portable device you desire and then start video conversion with this great alternative to Freemake Video Converter for Mac by pressing the "RUN" button, all making it happen in a few clicks. The two programs are fairly matched. It's hard to decide which one gains the upper hand even with the help of Freemake review. In a nutshell, one for Windows, one for Mac, both are excellent. So let's your operating system say. Are you looking for an alternative to Freemake Video Converter for Mac version? Surely, this tutorial shares a Freemake Video Converter for Mac alternative, such that you can convert your videos in any video format on your Mac computer. Top 4 best FFmpeg alternatives are listed and reviewed here, including faster and feature-rich FFmpeg alternative that can convert, download, record and edit videos without FFmpeg erros and limits, good open source free alternatives to FFmpeg. This article introduces the best KeepVid alternative for Mac to free download any YouTube videos on Mac. Free download KeepVid for Mac (Mojave included) and enjoy any online YouTube videos without KeepVid.